Zula is an All-American dog who is fully certified for trailing in Washington. Zula loves the search and cannot help but to "love-melt" into her subject at the end of the trail. Her favorite reward for a successful search is a nice jar of baby food. Zula is pretty sure that each day at search dog training is the best day of her life so far. 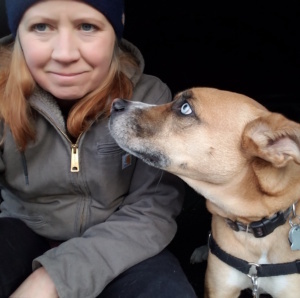 Jen joined KCSD with Zula in 2015 and really loves working each trail with her favorite team mate at the end of the leash. Jen is the current KCSD President-Elect and a member of the Board.